If you have an idea for a program or can suggest a guest speaker, please contact me. The June speaker will be Cindy Morrison and the presentation will be Teamsters and Waggoneers. The North used railroads to carry men, heavy weapons, and other supplies. But, each army had to carry with them supplies to use on a daily basis. Those supplies were carried in supply trains. Supply trains were made up of wagons, horses, mules, and teamsters who were the drivers. A teamster was a soldier and his job was very dirty and dangerous. When a wagon was empty, the teamster was sent back to a supply base to reload and return to the march or the camp. Cynthia Morrison, Davis Rafaidus and Miriam Rafaidus presented a program about George Armstrong Custer. David and Miriam did a brief scene between George and Libby Custer about his posting to Little Big Horn. Cynthia and David spoke about Custer’s life. A lively discussion followed afterward. Custer’s childhood ambition was to be a soldier. Custer’s father, a blacksmith and farmer, migrated westward to Ohio and Michigan. His father did nothing to discourage his hopes and saw to it that his son received sufficient education to qualify for a West Point cadetship. Never much of a student, Custer graduated 34th in the 34-man class of 1861 and proceeded directly to the battlefield. He fought with the Union’s 5th Cavalry at Bull Run and later served on the staffs of Philip Kearney, William F. Smith, and George McClellan. During the Peninsular Campaign of 1862 , one of his staff assignments involved supervision of balloon reconnaissance. Promotion came swiftly, and Custer won his brigadier’s star after leading a spirited cavalry charge at Aldie in June 1863. He commanded the Michigan Brigade of the 3rd Cavalry Division at Gettysburg, taking part in a sharp encounter with Wade Hampton’s Confederate cavalry on the second day of the battle. Tall, lithe, with ringlets of yellow hair, he was always something of an exhibitionist. He liked to think of himself as dashing but others often found him absurd. Wearing an elaborate uniform, Theodore Lyman thought he looked “like a circus rider gone mad.” He was undeniably courageous, excelling in such hell-for-leather operations with Philip Sheridan and the raid toward Richmond in May 1864. Custer advanced to within four miles of the Confederate capital. Custer, along with Sheridan, fought at the Dinwiddie Courthouse. In his greatest triumph, he led the advance in Sheridan’s relentless final pursuit of Lee’s army westward to Appomattox and received the first flag of truce from the Army of Northern Virginia. In a farewell order to his division shortly after Lee’s surrender, Custer claimed his command had captured 111 pieces of artillery, 65 battle flags, and 10,000 prisoners. After the war Custer served in Texas and later became lieutenant colonel of the 7th Cavalry. His first experience fighting Indians was against the Cheyenne in the spring of 1867. On November 27, 1868, Custer attacked and destroyed a large Cheyenne village of the Washita River in the Oklahoma territory, a bitter and bloody defeat that forced the Cheyenne to return to their reservation. From 1871 to 1873 he served the regiment in garrison in Elizabethtown, KY, where he wrote his well-regarded memoir My Life on the Plains. It showed a more thoughtful side of Custer, as did his efforts to reform the Bureau of Indian Affairs, that was riddled with corruption. He returned to the plains with the 7th Cavalry in 1873. The regiment had its first encounters with the hostile Sioux guarding the Northern Pacific Railroad. Custer set out on his last campaign on June 22, 1876, moving up the Rosebud River toward the headwaters of the Little Big Horn. On the morning of June 25 he divided his force into three parts and prepared for offensive operations against Sioux and Cheyenne war parties known to be in the area. Custer led five companies up the right band of the Little Big Horn and into a trap. A Sioux force of some 2,500 warriors ambushed his command and, after three hours of fighting, killed every man in it including Custer’s two brothers. On February 9, 1864, Custer married Elizabeth Clift Bacon (1842–1933), whom he had first seen when he was ten years old. He was introduced to her in November of1862, while home on leave. She was not impressed with him and her father, Judge Daniel Bacon, disapproved of Custer as a match. He was only the son of a blacksmith and thought that his daughter could do better. After Custer had been promoted to the rank of brevet brigadier general he gained the approval of Judge Bacon. He married Elizabeth Bacon fourteen months after they formally met. 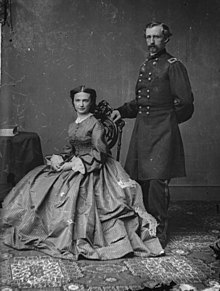 In November 1868, following the Battle of Washita River, Custer was alleged (by Captain Frederick Benteen, chief of scouts Ben Clark, and Cheyenne oral tradition) to have unofficially married Mo-nah-se-tah, daughter of the Cheyenne chief Little Rock in the winter of 1868. Mo-nah-se-tah gave birth to a child in January 1869, two months after the Washita battle. Cheyenne oral history tells that she also bore a second child, fathered by Custer in late 1869. Some historian believe that Custer had become sterile after contracting gonorrhea while at West Point and that the father was his brother Thomas. A descendant of the second child, who goes by the name Gail Custer, wrote a book about the affair. Clarke's description in his memoirs included the statement, "Custer picked out a fine looking one and had her in his tent every night.